Modern apartment, very bright and overlooking the sea. Very close to the beach (only 50 meters), which is accessed via a footbridge that part of the promenade, where the building housing the apartment is located (see pictures on this page Homeaway) . It consists of a bedroom with bathroom, double bedroom, bathroom shared use, living room with space for 6 people and sofa double bed, fully equipped kitchen (washer, dryer, refrigerator, microwave, dishwasher , oven, small appliances-irons, juicer, blender, toaster, pressure cooker, coffee ...). and full kitchen. Household linen (sheets, bedspreads, blankets, towels, tablecloths, ...). Wireless Local. From one of the ports of Vilanova (which also features a marina in modern facilities), recently built catamaran will take us to tour the river, and bring us to arosanos peoples belonging to the province of La Coruña (Puebla del caramiñal, Boiro) and the Isle of Ons, belonging to the Natural Park of the Atlantic Islands, and must. Vilanova de Arousa is also part of the Camino de Santiago del Mar de Arousa, where the influx of pilgrims increases year after year. Our town has also acquired an unusual prominence during the summer of 2013, for hosting the original output from a tray (platform mussel farming) in the first stage of the Tour of Spain. If you want to have a broader vision of our town, you can rescue the images of this event on the Internet. If something should also be noted in our town and its surroundings, the Salnés Valley, is its special microclimate, which makes you enjoy lower rainfall and nice and different from the rest of Galicia temperatures. In summer you can also find a friendly atmosphere of bars, restaurants and terraces. The low mass and continuous and fascinating spectacle of our sailors and shellfish tilling the sea, you can watch at any time, make Vilanova a special place, where everyone who visits us can feel at home. Gastronomy: La cuisine de Vilanova is based on seafood and fertile lands Salnés Valley, where it is located. In most restaurants, taverns and tapas bars (the best and most traditional in central and old part of town, away from the tourist port area), you can taste: good mussels in multiple preparations, squid, empanadas and rice (Bar the Rock), cuttlefish (Bar Pomares), clams (Bar Reiz), oysters, cockles, shellfish, octopus, squid, Padrón peppers ... In the month of August Traditional Gastronomic Mussel Festival is held and Cockle, excellent products of our people and of the sea, which can be paired with a good Albariño wine, since the villa is part of the Wine Route Designation of Origin Rias Baixas. Our visitors can also enjoy the privilege of purchasing fresh fish and seafood, along with the products of countrywomen, in our small but well-stocked food market. FESTIVALS AND AROUND: In August we held in Vilanova the celebrations in honor of the Virgen del Carmen, where sailors and decorate their boats and mussel lend delighted to take on the Maritime Procession who was so requests. It is also worth visiting the town of A Illa de Arousa, just 4 Km, and that can be accessed through the bridge, while enjoying wonderful views. It has countless idyllic coves, many of them virtually deserted. Carreirón Natural Park, the lighthouse and Gastronomic Festivals, octopus being the most renowned are places and events that should not be missed. Just 6 km is Cambados with its many manor houses, squares, streets and ruins and summer celebrating its famous Fiesta del Albariño very lively, inviting many visitors and youth clubs. Also at 6 Km, Arousa celebrated in August the festivities in honor of San Roque or Fiestas del Agua, where anyone who dares to tread the streets will be wet between a party atmosphere and ease. In his most famous parish, do honor to their best product in the Clam Festival Lane. Also in Vilagarcía, during Holy Week, we celebrate the Vilagarcía Basket Cup, three days a lot of basketball, coexistence and sportsmanship at its best. Definitely a great experience for all players and their families. Thanks to its strategic location and excellent communications, from our people can also easily visit Portugal and elsewhere in our community: Santiago de Compostela, La Coruña, Pontevedra, Vigo (from which to visit Cies Islands) .. .
'Vilanova de Arousa is a quiet place, where there are places where you're all that happens. In fifteen days of vacation not remember seeing more than two cars waiting their turn at an intersection. Everything is handmade, so you could say that even the cars go walk anywhere. At nightfall heard from the street floret while dining cutlery of people. So cool, as I recall that as a child he left cooled in Cambados walk after supper and I ensimismaba watching it burn across the estuary Mount Curota, consumed by an indolent pique fire as it seemed to me that served to refresh the forest while my mother and my aunt Pepita cardigan is fastened around the neck, shaken by a cold without malice that it seemed wool. In Vilanova was born Ramón María del Valle Inclán, which was a type with just meat to convert hunger packaging. It is also the birthplace of Julio Camba, a writer enviable pen while a man with the wisdom to live in the Hotel Palace almost without spending a penny, in a show pride of their proverbial ability to convert shortages in luxury almost noble. In Vilanova is a museum dedicated to Valle Inclán, who also honors a bronze figure sitting on a bench near the bandstand in the square where a week ago I was one of the fifteen spectators who attended the performance of a vocal trio that amid strict solitude listened perfectly breathing, repentance and saliva. Then I went to the pier, lit a also cigarette for each hand and amused myself listening to the gentle washing of the tide coughing between ships. And then I thought that Don Ramón del Valle-Inclan was born in the best place in the world and that if ever he questioned its origin, was because he feared that the prosperity of tourism carry forward this fertile and humble orb with which I had barely successful that sea of ​​Arousa, where evening wear long sleeves even flags'. This is our people. If you want somewhere in the world to practice desconecting, enjoy the small and simple pleasures of life and charge your batteries to continue, this is your people and we are your hosts. Estupendas playas, apartamento muy bien situado y cerca de todas partes. Muy limpio y cómodo. Estancia muy tranquila y acogedora. Agradecer la amabilidad y simpatía de Miguel y Mónica. Hasta pronto!!!! El apartamento es tal y como se describe en el anuncio y en las fotos. La situación no puede ser mejor, cerquita de playas y largos paseos, chiringuitos etc. Un precioso sitio para pasar unos días tranquilos. Monica encantadora. Totalmente recomendable. Fantástico apartamento junto al mar! Pasé una semana con mi familia y nuestra estancia fue estupenda. El apartamento limpio y las imágenes mostradas en el anuncio se corresponden con la realidad. El trato de Ana fue estupendo, siempre atenta. La ubicación del apartamento no puede ser mejor a 2 minutos de la playa y las vistas son espectaculares. Repetería sin dudarlo y lo recomendaré a mis conocidos. 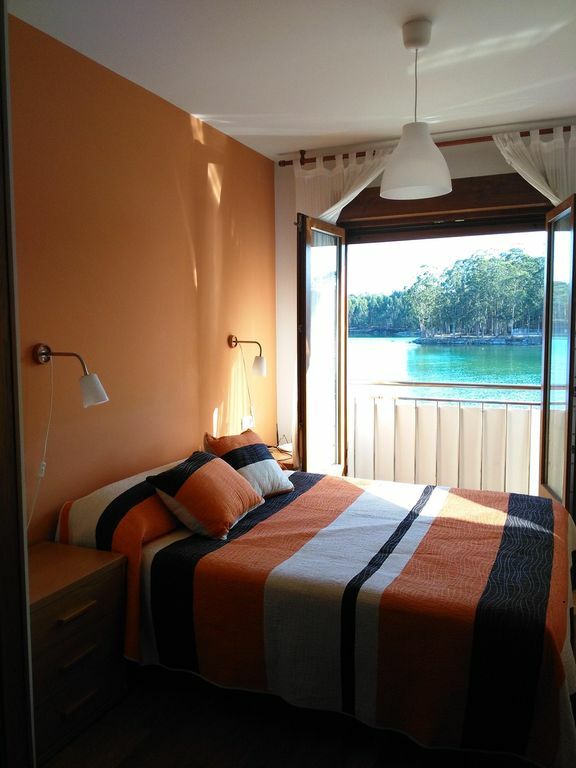 Apartment in the Ría de Arosa (Valle del Salnés) new, very bright and modern design near the beach, on the promenade and the marina, with boat rental service to navigate. Other Activities: sailing, tourist train, theater festival, hiking.